Sauerkraut can be cooked in different ways, and there are many recipes in Germany for Sauerkraut. 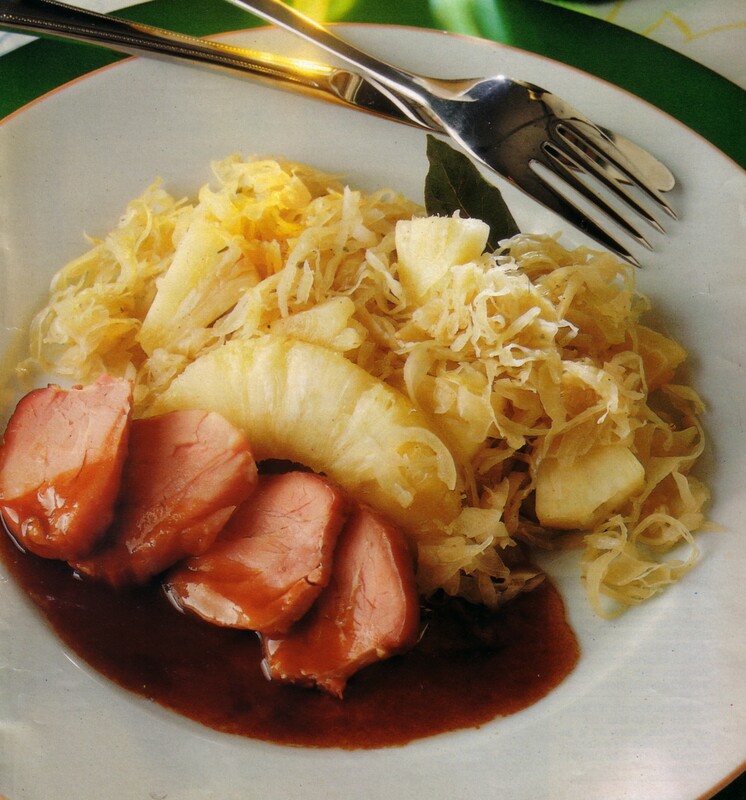 One is the German pineapple Sauerkraut recipe that we want to show you today. You may not think that Sauerkraut is very tasty together with pineapples. But it is very yummy. There is a funny German story connected to pineapples: Back when Emperor Karl V. was reigning, he refused to eat this strange looking fruit that his men brought from their discovery journeys. He was afraid that this fruit might be poisoning. Well, after 600 years we know that pineapples are a great source for vitamin B1, B2, B6 and C. Its protein-digesting enzyme bromelain seems to help digestion at the end of a high protein meal. And in combination with Sauerkraut it provides a good deal of Vitamin C. Happy Cooking! 1. Peel onions, cut them in half, then cut half rings; saute them in the butter or ghee. 2. Add Sauerkraut, bay leaves, juniper berries, Sekt, salt, pepper and sugar and let it simmer for 10 minutes. 3. Cut six pieces out of the pineapple; cut the stem off and cut of the peel, cut in small cubes. 4. Add pineapple to the Sauerkraut and let it simmer for another 20 minutes. 5. Spice with salt and pepper if necessary. Serve with boiled potatoes and Bratwurst or fried (boiled) Kassler.